Recorded magnetically on a flat disk of magnetic material this item was used as a dictation machine. The Emidicta was an attempt by EMI to break into the lucrative office dictation machine market. The brand leader, at that time, was the Dictaphone which, unlike its rivals, used an easily manageable, ferro-magnetic belt - The Dictabelt, instead of tape. A recording head, mounted on a lead screw, moved across the belt producing a helical track. EMI applied their gramophone experience and came up with The Emidicta. This substituted a 12" or 7" ferro-magnetic disc, as the recording medium, running on a high quality turntable. The quality was far superior to the Dictaphone, due to EMI's experience in audio technology. The machines, however, were many times larger, clumsier and more difficult to operate than a Dictaphone and so were a relative failure. 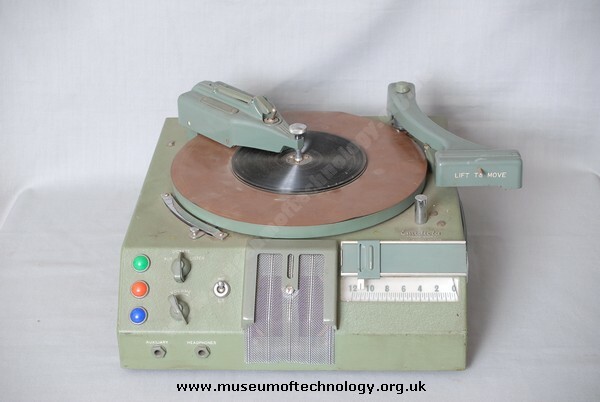 It was, however, the world's first ever flexible, ferro-magnetic, recording disc (Floppy Disk) and led directly to the following spin offs, in order: The Ampex Television, Slow Motion Machine. The 12", 8" and 3.25" computer Floppy Disks. All the various sizes of computer Hard Disks currently available. Only when the last magnetic storage media is consigned to history, in favour of totally Solid State Storage, will the influence of The Emidicta truly come to a close. I have an old cardboard box (sadly now empty) which has on it a label with the following interesting wording that seems to relate to this item. "CERTIFICATE" "THIS CASE COMPLIES WITH SPECIFICATION NO. 13200 RECORD AT THE RAILWAYS CLEARING HOUSE AND IS APPROVED FOR THE CONVEYANCE OF AN EMIDICTA TYPIST CONTROL EXPERIMENTALLY, AT THE COMPANY'S RISK.